Hello Friends and Happy Thursday! Life has been busy here at the Mock house. Here’s what we have been up to! I really really need to get back to the Library! I have a few books on my list, but I have been just too busy! Hallie misses Storytime though. So that’s definitely on my to-do list for next week! Nothing really! We actually don’t have cable, So we have been watching a lot of reruns on Netflix and that’s about it! It’s kind of refreshing actually…but I can’t say I don’t miss my DVR! Coffee Coffee Coffee and more coffee! We got some rain this week which made me want soup! 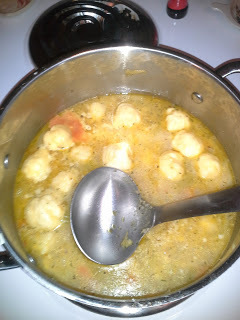 I made my first pot of Chicken and Dumplings a little early this year! That all of my hard work pays off! Hallie has been requesting Disney Pandora almost every day! Socklings! Lots and lots of work for Socklings! But I love it! Fall! This heat is getting exhausting! My new Erin Condren planner…most of you know I am a planner snob and this one is AMAZING! I might have spent $100. on this website…oops! I am OBSESSED with the Mellow Melon Socklings! I can’t wait to get them for Hal! Pre-order ends Aug. 1st…go order now! Hallie finally knows all of her colors so I thought it would be fun to show her how to mix Primary colors to make Secondary colors! She had SO much fun! Then I walked her through mixing each set. I would have her predict what color each mixture would make, and then I would tell her to mix it! It was so fun watching her amazed little face when a new color appeared on the paper! Once we had mixed all of the colors, Hallie asked to paint some more! She had a blast! The little things! What are your favorite art activities? Sometimes you just need to dance in the rain! Today started off pretty gloomy. Hallie woke up not feeling great and it was clearly about to rain. (Not that I minded because it was a welcome break from the 100+ days we’ve been having here in DFW) Regardless, it was just kind of a for lack of a better term “blah day”. We did a lot of resting, a lot of movie watching and a lot of drinking fluids! Thankfully after nap, Hallie was feeling much better and I was going stir crazy. I let her grab her new umbrella and we headed outside to dance in the rain, because sometimes that’ just what a “blah day” calls for! Anyway, I finally convinced Hallie who was sobbing to put on some moccs and promised to take her shopping for some new ballet shoes this weekend, and we headed to class. She had a blast! Hallie has a new favorite thing! It is called Hooray Mail and it is the neatest thing ever! It reminds me of getting Highlights magazines as a kid, but way cooler! It is a subscription service where Hallie can get her very own mail twice a week! Hallie really enjoys getting mail and of course all mail says the same exact thing “Dear Hallie, come to Hallie’s birthday party, the end!” Poor kid is going to be waiting a while for her next birthday party! At least in the mean time we have Hooray Mail! Each letter has a personalized note from us to Hallie and a fun learning activity for the child! This month’s was Fourth of July themed and all about the presidents. Hallie couldn’t wait to get inside and start working on her activities! The activities this month had a puzzle that Hallie got to color. Then we had to cut it out and let Hallie put the pieces back in order. Then on the back there was a huge flag. The extension activity was to count the stripes on the flag as well as the points on each star. Then we talked about the colors on the flag! Hallie really enjoyed it and can’t wait to get her next letter later this month! Want to learn more about Hooray Mail? Hallie’s 2 year photos are finally here! Let me tell you, they were totally worth the wait!! These photos totally show off Hallie’s little personality and I couldn’t be more in love with them…also Hello 2 year old attitude! The pout! This face was actually brought on by my sweet photographer’s daughter who is one of Hal’s friends…they are only 3 weeks apart. Darling Mira was equally excited about Hallie’s balloons…Hallie was NOT having it! Hallie of course had to make sure to add some dancing to her 2 year shoot…her favorite thing to do! Look at those moves! Some kids might be scared of a dog 5X their size..not my kid! Poor sweet Mira…This was definitely a stare down…I can just hear Hallie “Don’t touch my balloons!” 2 year olds! National Teddy Bear Picnic Day! Sunday was National Teddy Bear Picnic Day! Of Course we had to celebrate! I am FINALLY getting around to posting about Hallie’s Mouskaparty! Between helping launch a new business and being sick over here (2x now! Once possible West Nile Virus…yes only me!) blogging has been a bit on the back burner! But this week I am back and ready to rock and roll! So many helping hands went into this party! Thanks to my Mother in Law for helping with the food, and My aunt Jane, Father in Law, Sweet husband and Sisters for helping me decorate! We had a photo booth! I made ALL of the props myself which was so fun, and everyone really enjoyed taking photos! I wish more people had used the #Halliesclubhouse, but it was still a fun idea! Mrs Sindi and Mr Justin came all the way from Houston to help Hal celebrate! In the entry way, everyone got to choose some ears to wear! The Cupcakes, which were a HUGE hit! Hallie had decided months ago that she would eat a Daisy one and she enjoyed telling everyone else which kind they could eat too! The Mantle complete with the wooden letters I made, the invitation and Hallie’s gorgeous Minnie Doll! My Aunt Jane made all of these adorable paper flowers! Clubhouse sign…my Father in Law and Husband were kind enough to create this sign! Hallie and I painted it! Our WHOLE Mom’s group was there! It’s seriously a Mystical occurrence! My FIL also made us Mommy and Daddy shirts! And that’s that! It was a really fun party! Thank you to everyone who helped and those who came to celebrate 2 years of this girl!